Reports from Trump rallies in recent days echo a common theme: if their candidate loses there will be anger, despair, even revolution. Trump supporters site the election as being rigged – of which there is no evidence – and a corrupt system. It’s language the presidential candidate himself uses. While political reporters note most Trump supporters are not calling for “revolution” the words from the campaign this season have many asking what constitutes dangerous political speech and how it can incite people to act. We get perspectives from a political scientist, a reporter and legal scholars. Doyle McManus Washington columnist, The Los Angeles Times. Garrett Epps Professor of law, University of Baltimore; contributing writer and Supreme Court correspondent, TheAtlantic.com; author of “To An Unknown God: Religious Freedom on Trial" and "American Justice 2014: Nine Clashing Visions on the Supreme Court"
MS. DIANE REHMThanks for joining us. I'm Diane Rehm. 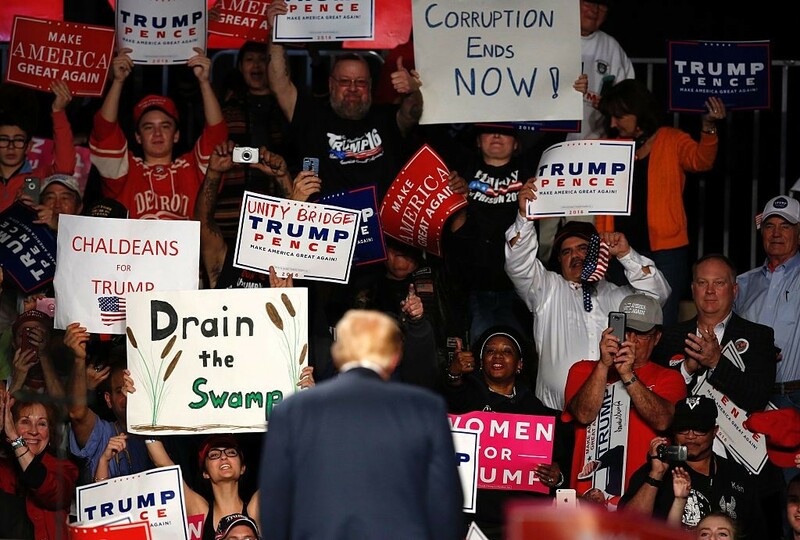 The election is now less than a week away and stories from Trump rallies have indicated that some of his supporters are warning of a revolution if their candidate loses. Here with me to make sense of what we are hearing, what it means and more broadly, what constitutes dangerous political speech, Doyle McManus of the LA Times, Garrett Epps, professor of law at the University of Baltimore. With us from the studios of KAMU in College Station, Texas, Jennifer Mercieca, of Texas A&M University and by phone from Boson, Susan Benesch, director of the Dangerous Speech Project. MS. DIANE REHMI'm sure many of you will want to join in. Give us a call at 800-433-8850. Send an email to drshow@wamu.org. Follow us on Facebook or Twitter. And thank you all for being with us. MR. DOYLE MCMANUSGood morning, Diane. REHMDoyle, I'll start with you. What are you hearing when you're out with Trump supporters? MCMANUSWell, I spent part of last week at a bunch of Donald Trump rallies in Ohio, specifically not to listen to Donald Trump, who's still giving the same speech he's been giving all year long, but to talk to his most ardent supporters, the people who turn out early in the morning or late on a chilly evening to go to a long rally where you have to stand in an arena for a long time waiting for him to show up and to kind of take their temperature. MCMANUSAnd here is what I found. Folks who support Donald Trump are certain that he's right. They are certain that Hillary Clinton is crooked. They are certain that if there is a fair election, Donald Trump will win it and that if Donald Trump doesn't win it, something's wrong, that the election is rigged, that the election will have been stolen. Now, that's a kind of a near universal set of articles of faith among the Trump faithful. MCMANUSNow, there is a minority in that group that if you ask them, so what will you do after the election, most of them say, well, we'll be angry, we'll be upset, we'll contest the election if we can, but there's a minority who say, well, there could be a civil war then. There could be a revolution. And I talked to a number of those people, again, a small minority of Trump supporters and I said, well, what do you mean by that? In fact, I talked to one man who had lectured me at some length about Hillary Clinton plotting to take away their guns. MCMANUSHe was wearing a National Rifle Association hat. And I said, well, would you get your guns out? And he looked at me as if I had gone nuts and he said, no, we know what to do with our guns and that's not it. So I think this is a hard -- I think when we're talking about the broad number of people supporting Donald Trump, there's no sign of an insurgent, armed revolutionary movement going on there. There are people talking this way out of anger and frustration and confusion about polls they don't believe. MCMANUSI do think there's a set of concerns that we will talk about, about extremists in white nationalist movements and other places, but among most Trump supporters, I think it's important to say that we are talking here about a minority of hotheads and even they aren't the scariest people on Earth. REHMSo Jennifer Mercieca, you study political rhetoric. Conspiracy and corruption is something we have heard throughout this election process. What do you make of those words? You know, we're going to bring a civil war to bear. We're going to create a revolution. MERCIECAWell, it's interesting because the foundation of American political discourse about citizenship is smaller Republicanism, which is a language of critique and corruption. Our job as citizens is to critique the government. In fact, that was the main action that we were given within the constitutional structure in 1787. And so this idea that we ought to be on the lookout for conspiracy and for corruption is a part of what we hold dear as our job as citizens. MERCIECAOn the other hand, it can be easily exploited. And so I think what we've seen with the Trump campaign is a political candidate who has taken advantage of preexisting frustration and distrust and polarization in the electorate, has used rhetorical strategies that refuse to -- that enable him to refuse to be held accountable for his actions and for his arguments and for his innuendo and circulating rumor. And I think that he's been able to tap into this preexisting distrust and frustration and take advantage of it for his own ends. MERCIECAAnd it's been unpleasant to watch, I think. REHMAnd in fact, you've spent the past six years developing and testing what I gather is a framework for identifying dangerous speech. Can you give us a -- briefly, an outline of that and to what extent you feel that what Donald Trump is saying falls into that category? MERCIECAWell, I have spent the last few years thinking about demagoguery and particularly what I think identifies or distinguishes the demagogue for another -- from another kind of political leader is someone who refuses to be held accountable. To me, that is dangerous. It subverts the Constitution. Our Constitution is premised on the notion of transparency and accountability and so we can identify the demagogue is a person who refuses to allow themselves to be held accountable. REHMAll right. Susan Benesch, I'll come to you on that. BENESCHSo I have indeed identified what I describe as dangerous speech, Diane. That is speech that increases the risk of intergroup violence, that is to say the risk that one group of people will turn violently against another. I can analyze a particular example of speech, according to a series of contextual factors. After all, we can't really understand what kind of power speech has just by looking at its content. I could say something extremely inflammatory to you right now and I feel very confident that you would not take up arms or react violently in any other way. BENESCHSo those factors are the speaker. Some speakers are much more influential, have much more capacity to persuade people to do anything, including violence. Another factor is the audience. Some audiences are, for various reasons, more susceptible to an inflammatory message. The content itself is, of course, important. Two other contextual questions we ask are what is a social and historical context and, of course, that's enormously important. And finally, what is the medium? What is the means of dissemination, which can sometimes make a message more powerful, can give it more capacity to influence people? BENESCHI have also identified, from studying the messages that ill-intentioned leaders use to turn one group of people violently against another. In fact, in history, I've studied many of these examples and have been struck at what uncanny patterns spring out from many of these examples across cultures, across historical periods, across countries. In other words, there is no, for better and for worse, there is no culture, there's no religion, there is no nationality that specializes in this or there is also, in my view, no group of people not susceptible to some degree to dangerous speech. BENESCHI have observed what I call hallmarks of dangerous speech and Donald Trump has used some of those. I observed that he crossed the line in August when he referred to the Second Amendment in a way that was, of course, much debated. There was debate about whether he had actually called for an assassination of Hillary Clinton. I think that's surely not true. In any case, we cannot know. The important question is, how did people understand him and how are people likely to react? That is the essential inquiry of this idea of mine, which is to define a category of speech called dangerous speech because it's the consequence that we ought to worry about. BENESCHI'm not very much interested in what's in the mind of the speaker. So in referring to the Second Amendment in the way that Trump did, it seems clear to me that he was referring to violence. REHM...I've got to -- hold on. Hold on. I've got to take a short break here. And when we come back, we'll delve further into what is called dangerous speech and we'll go to Garrett Epps on the First Amendment, take your calls. I look forward to hearing from you. REHMAnd welcome back. Before we come back to you, Susan Benesch, I do want to get Garrett Epps into this conversation. He's professor of law at the University of Baltimore. And what is all this speech, as we know it, to what extent is it simply protected by the First Amendment? EPPSWell virtually everything Trump has said in this campaign has stayed on the protected side of the First Amendment, including that Second Amendment remark, which, you know, whatever rhetorical line it crossed. The First Amendment allows punishment for incitement only in situations where the violence is going to follow immediately. So Trump was actually investigated by a North Carolina sheriff's department for a rally he held, where he urged the crowd to beat up protestors, and one of them got beat up. EPPSBut that’s the only case that I can think of where his rhetoric has gotten close to the line. He's basically stayed on the side of saying, oh, this is just rough and tumble political rhetoric, and political rhetoric is very highly protected in our system, for better or worse. REHMAnd do you see any other, by implication or simply by the use of the rhetoric, the danger of incitement? EPPSI think incitement is probably, as far as getting Trump on the hook, is probably a lost cause. Now some of the things that are going on at the local level perhaps. What's more interesting legally is that it seems to be some of the stuff Trump is talking about can be used in court to illustrate the intent of people who are behaving in a certain way. EPPSAnd on the way over here I was reading about the vote suppression litigation that's, you know, underway now against these informal groups that claim they're going to go and keep voters away for the polls. And the lawyers who are seeking an injunction against this behavior have filed with the court a number of statements that Trump has made to show the court what these people intend to do. It doesn't make Trump penalize, but it could put his supporters on the hook in various circumstances. REHMAnd Doyle McManus, you talk about exactly what it is that Trump says on election night that could make all the difference if he were to lose. MCMANUSThat's right. Susan Benesch was saying it's not only important what's in the mind of the speaker but what is in the mind of the person -- the follower who's listening to him. Well, Donald Trump has an influence over what is in the mind of his followers. It matters what he says over the week to come about, for example, how many of them should turn out as volunteer poll watchers with the possibility of intimidating voters, and it is critical, it seems to me, what he says on election night and the next morning if he loses or, in Trump world, if the crooked media say he loses. MCMANUSDoes -- will he say this election was rigged? Will he tell -- will he issue a John McCain graceful saying Hillary Clinton is our next president, I will support her? That's rather difficult to believe give the framework he's built for his followers. Will he tell him, on the other extreme, that their duty is to resist this outcome? It seems to me that's an absolutely critical step, and that will be on Donald Trump. REHMGarrett Epps, you also wrote that Trump has begun an assault on the concept of free speech. EPPSWell yeah, the intriguing thing about Trump as a phenomenon is that while he arrogates to himself the right to cross all kinds of rhetorical lines, any criticism of him or even reporting about him that he objects to he believes should be illegal. He believes it is illegal. They've attempted to use the cease and desist letter on a number of independent media during this campaign, and he's pledged that if he becomes president, he will, quote, open up the libel laws. EPPSI think in terms of libel, he has in mind what used to be called seditious libel. That was -- at the common law it was a crime to say anything bad about people in authority. Whether it was true or not was irrelevant. We kind of put that behind us in 1965 with New York Times versus Sullivan, where the court said the concept of seditious libel has no place in our free speech. But Trump clearly believes that. EPPSAnd even things that are clearly not defamatory he has tried to suppress, such as People magazine reporting that his wife saw Natasha Stoynoff, the reporter, on the street and was nice to her. They sent a letter saying we're going to sue you because this is false. So it's a one-way street with Trump. He talks, we listen, we don't talk. REHMOkay, let me ask you about one particular word, devil. And the reason I ask about that word is that among many of Trump's supporters are religious conservatives. REHMHow do they feel, how do they interpret, or how should we interpret, his use of the word devil? EPPSWell, I'm sure that a court reviewing any of this speech would say no reasonable person would believe he was saying that she, you know, literally is Satan. The fact is there is going to be a minority of people who do believe that, many already do, but in law it's the -- a kind of reasonable person standard is used to assess that. And a lot of the harmful speech that Susan has talked about our system simply does not have any way of controlling. EPPSWe have made a conscious choice over the years to let people err on the side of saying inflammatory things. REHMJennifer, you've analyzed Trump's speech and some of its characteristic. Talk about paralipsis. Talk about exactly what that means and what you mean. MERCIECAYeah, paralipses is a rhetorical figure that I paraphrase as I'm not saying, I'm just saying. So he likes to -- yeah, it's his favorite thing to do. He likes to, for example, retweet white supremacists, and then he says, oh, I don't know, I just retweeted it, I wasn't really saying it, I'm just -- I like to start dialogue, I'm just putting it out there. Or he'll -- he'll say things like he did in New Hampshire last December, where he said, you know, well, there -- all my opponents are just weak, and they're weak generally, if you want to know the truth, but I won't say that they're weak generally because I don't want to get into any trouble, I don't want any controversies, no controversies, okay, so I won't say that they're weak generally, but I think they're weak generally, and some of them are good people. MERCIECARight, it's funny, it's hilarious actually, it's what stand-up comedians do, but it's also a way of saying something, implying something, circulating innuendo without being held accountable. And to go back to the example of the Second Amendment solutions, the reason why that works and why it was debated and perhaps not incitement is that it was ad baculum, so it's a threat of force, but he used paralipses, as well. And so you can't tell exactly what he said. You can't know if, for example, he is actually trying to incite violence or if he's just saying something that could possibly happen, but he doesn't know, and you can't really, you know, hold him accountable for it, which is, as I've been trying to say, what I think is the defining feature of demagoguery. REHMAnd for you, Susan, what is the difference between dangerous speech and hate speech? BENESCHSo dangerous speech, Diane, is speech that can inspire violence, that has a special capacity to inspire violence. Hate speech is a very familiar term but is understood differently in colloquial use by almost any two people you might ask to define it. You also cannot find two bodies of law that define it the same way. Generally speaking, though, hate speech is speech is speech that vilifies or denigrates a person or people based on their shared identity of some kind, their membership in some sort of group. They come from the same religion, the same race, the same sexual orientation, for example, and so forth. BENESCHI want to clarify, Diane, that Trump's speech has had, in some cases, on some rare occasions, features of dangerous speech. However, it is not necessarily dangerous unless it has the capacity to inspire intergroup violence. And Doyle has very helpfully pointed out to us that Trump supporters, like, btw, Hillary Clinton supporters, many of them, are dispirited, are angry, are frustrated by this electoral process. BENESCHThe vast majority of them have absolutely no intention of resorting to violence. First of all, many people say all sorts of things, even in a situation that isn't as fraught as this moment on the brink of the election in this country, say things that they don't mean. Only a very small proportion of people in a relatively health society commit violence, of course, and only a very small proportion of people who even talk about committing violence will actually do it. So we have to be careful not to take too seriously everything that people say. BENESCHAnother point is that Trump is not the only one speaking in ways that should in my view cause concern. It's easy to become completely fixated on the speech of one person, and of course he is a presidential candidate and therefore very important, but the governors of Maine and Kentucky have made much more explicit statements quite recently referring to violence. BENESCHThe governor of Kentucky, Matt Bevin, referred to a famous quote by Thomas Jefferson in which Jefferson that may be time to water the tree of liberty with the blood of patriots. Bevin suggested that if Hillary Clinton wins the election, such -- that might be necessary. And the governor of Maine, Paul LePage, who has been saying quite racist and shocking things for many years, long before Trump became a candidate, recently identified Hispanics as the enemy and said what you do to enemies is shoot them. BENESCHSo I would suggest that we have an opportunity as a people to uphold our extraordinary Second Amendment -- pardon me, our extraordinary First Amendment commitment to, as Garrett has said, allow people to speak very openly and even outrageously, and to redefine our discourse norms. BENESCHWhere are the lines between what it is acceptable to say, even though it's sometimes offensive and even hurtful, and what is unacceptable? REHMAnd Doyle, the question becomes how and why has this kind of rhetoric become so ingrained in this year's, this election cycle? MCMANUSAnd I think a great part of the answer is that Donald Trump has encouraged it, and he's encouraged it deliberately. There's been this kind of talk on the fringe for a long time, but we've never had a presidential nominee of a major party say this kind of thing from the stump. He has broken the norms and broken new ground. REHMDoyle McManus, Washington columnist for The Los Angeles Times. And you're listening to the Diane Rehm Show. But then you're left with the question, why has this style become so effective this year. MCMANUSAnd that is really one for the historians, and I went all the back to Richard Hofstadter, who in the '60s wrote about the paranoid style in American politics. So we're not talking about something entirely new. But what we are talking about in a sense is an extension of the political polarization that we have seen over the last 20 years, the creation of information zones where people, you know, only get information from their own side. MCMANUSSo if you go out to a Trump rally, and you talk to Trump supporters about what they understand is going on out there, they have a completely different set of information than most of the rest of us do because they get their information from social media. We're not even talking here about talk radio anymore, like Rush Limbaugh or Glenn Beck. They've moved beyond that, and so you have in effect a belief system out there, and I think just to connect it to something we were talking about before, you connect that to the demonization of the other side. MCMANUSWhen Hillary Clinton is referred to as Satan, demonization is no longer a metaphor. We're talking -- we're talking literally here. And so you have created, to get fancy here for a journalist, a belief structure and a permission structure where we are not in a normal electoral process that should end in conciliation and unity at the end, we are in a metaphorical civil war. REHMJennifer, why do you think this has been so effective this year? MERCIECAI actually agree absolutely. Just to add a little a bit more to that, Michel Foucault talks about regimes of truth, and when we think about like a dominant discourse community, one that is a unified media environment where people are getting their information from, you know, three or four sort of consistent sources like we might have been doing in the '70s and '80s, you know, it's difficult for conspiracy to take hold. MERCIECABut where we have a fractured media that is anchored by polarization and frustration, and people are able to choose confirming discourses, then what we do find is that conspiracy rhetoric can flourish because it does allow for a complete narrative that is circular in its reasoning, right. There is a conspiracy, people would never tell you the truth about the conspiracy, so as many times as it's denied by official sources, right, they've been infiltrated, as well. This is the logic of Hofstadter's paranoid style. MERCIECAAnd so it's really difficult to disprove conspiracy once it takes hold, and it does flourish in these sort of broken or fractured truth communities like we have now. REHMAnd Garrett, you, too, think it's important where the information is coming from. EPPSWell yes, you know, because there is a way of talking, and Susan I'm sure knows much more about this than I do, that is sort of self-sealing, it's like some kind of hardware product you buy that you put it on, and it instantly dries, and, you know, we were just talking about some of the -- you know, they won't tell you, but, or have you ever noticed that no one ever mentions X, that clearly means X is happening. EPPSAnd if people don't hear counter-speech, if people don't hear critical appraisals of that, it is very seductive. It fits in the patterns that are in people's minds, and, as Doyle said, the patterns of American rhetoric going back to the 1800 election, where Jefferson was called a foreign devil who was going to burn all the churches, that's what makes it so powerful. REHMGarrett Epps, professor of law at the University of Baltimore. Short break, our lines are filled. We'll open the phones when we come back. REHMWelcome back. There are many of you on the phone. Many Trump supporters, many anti-Trump people. I'll try to be as fair as possible in bringing both sides onto the air. First to Jay in Bethesda, Maryland. You're on the air. JAYThank you. I would like to point out that the bias of NPR is overwhelming. In the beginning of the show, you described Trump in terms of the newsfeed in every negative adjective. Then, when you went to Hillary Clinton, there was absolutely no bias whatsoever. It was all, with everything that's going on with her, there was no negative adjectives. The second thing is Hillary Clinton has described Republicans as her enemy. She did that on national TV during a primary. JAYAnd then, her husband repeated that. And she's also called us deplorables and irredeemables. And I just, as I listen to this program, I just think the news media is negligent in terms of their coverage. And describing Donald Trump as this revolutionary who's going to cause all this violence, where the DNC has orchestrated violence at Trump rallies by the DNC contractor who was let go. MCMANUSWell, I think Jay wasn't listening too closely to the nuances that we were trying to make clear here. But let me just take the one piece of information about the DNC contractor who, in his words, and in the words of a lot of Trump supporters, allegedly orchestrated violence at Trump rallies. Actually, what happened was there was, in fact, a sub-contractor for a DNC contractor who gave an interview to the conservative activist James O'Keefe's people, who were using a hidden camera at the time. MCMANUSAnd he bragged about finding people to go outside Trump rallies to see if they could start arguments and pick camera ready fights on the street for -- and by fights, I mean, I mean, I mean arguments, not fistfights. On the street for news cameras to capture. They did not, and this is an alleged plot. There's not a great deal of evidence to say that this actually happened. But most of what this guy was saying was we're going to try and provoke some interesting arguments on the street. MCMANUSHe did not say we're going to do anything in a Trump rally, and there is no evidence, nor any report, that they actually did incite violence inside a Trump rally. REHMAll right, let's go to Frank in Sarasota, Florida. You're on the air. FRANKThank you, Diane. I just want to say that I think Trump, regardless of his distancing rhetoric, I think just by saying these things, whether they're tweets or at rallies, he's tacitly consenting to them, whether or not he wants his supporters to act on them. I think he wants to get them out there and at the bare minimum, he just wants to try and rally his base. So, thank you very much. MERCIECAOh yeah. I love that you used the phrase tacit consent. That comes from Locke, obviously, and I think that's a great way of describing it. Yeah, so, and that's another way that it's hard to hold him accountable, because it's not expressed consent, as Locke would tell us, right? The act of giving of your approval, but it is, instead, a kind of tacit consent. I just retweeted this, and, you know, who knows? I like to start conversation. It's interesting. That's what he said. It's interesting. REHMAll right. To Joe in Cleveland, Ohio. You're on the air. JOEFirst of all, I'm not a Trump supporter or a Hillary supporter. I'm a Gary Johnson supporter, so just to put -- understand where I'm coming from. But I halfway agree with the first caller. I'm just astounded that this is all Trump, Trump, Trump, Trump, Trump, right? I mean, Hillary has called people deplorable. Hillary has tacitly approved of the Black Lives Matter, which actually has led to actual, real violence. Hillary has tacitly approved of Occupy Wall Street, which actually did produce real violence. JOEThe Trump rallies -- I'm not voting for the guy. I think he's crass. But there haven't been -- there's been very little Trump induced actual violence. Trump's headquarters in North Carolina were firebombed. I mean, this does show NPR's unbelievable bias that you haven't even referred to one instance of Hillary's hate speech or Hillary tacitly (unintelligible) applying to anybody. I mean, what about the violence that has actually occurred? EPPSWell, I think, rhetorically, the first thing to notice is that on one hand, we have someone saying deplorable, which is really, if you think about it, is not a nice thing to say about anybody. But I mean, in terms of harshness, it's, you know, is it, I mean, are they mildly regrettable? Are they persons to whom we direct our disapproval? This is really not hate speech. This is, this is political rhetoric. On the other hand, we have someone saying, knock the crap out of them. We have someone saying, second amendment people, I don't know. It really is not equivalent rhetorically. BENESCHI would have to agree regarding the speech. Indeed, deplorable is a criticism or an insult. We haven't mentioned that the other candidate, Donald Trump, referred to Hillary Clinton and President Obama as founders of ISIS. ISIS is, if you ask any American, who is the principle enemy, true enemy of the United States at the moment? The answer would surely be ISIS, and so, of course, that claim is preposterous. And a conservative interviewer, soon after Trump said that in August, tried to help him out of it by saying you didn't really mean that, right? BENESCHYou mean just that, perhaps, Obama and Clinton policies helped ISIS to emerge. And Trump said no, I mean that they actually founded ISIS. That is, again, a completely different kind of claim. It tends to describe someone as not only an enemy but a traitor to the in group. Somebody who purports to be a leader of one group, but in fact, works for the other side. BENESCHIs, is a traitor and a traitor is one of the worst kinds of people in the view of the law and in view of social norms. I would say, though, that it is important to notice that violence has been committed, indeed, against Trump supporters, not only by Trump supporters. In that regard, I think we -- we do need to pay attention to what these callers have said. REHMDoyle. Violence against Trump supporters? MCMANUSWell, yes. There has been. There have been punches thrown. There have been eggs thrown in San Jose. There was that, that bombing in North Carolina. And that is reprehensible. There is no sign that that has been directed by the Clinton campaign, and there has been, if you compare the rhetoric, you know, we -- there is no equivalence here. False or true equivalence. There has been no discernible rhetoric from the Clinton campaign beyond the word deplorable that encourages that kind of stuff. REHMAll right, to Joy in San Antonio, Texas. You're on the air. JOYGood morning, Diane. Thank you for speaking with me. You were talking about Donald Trump's speech. I do think it is hate speech, and if he were to become President with all the things that he says that he is going to do, it's very reminiscent to me of speeches that fascists and communists have made in the past. Thank you. EPPSYeah, on the question of hate speech, a lot of people have said this, and I think that in terms of just the way we talk, some of these things, Obama's a Muslim, you know, Muslim ban, they were cheering for the 9/11. These things really would qualify under virtually any standard as hate speech. Under our system, hate speech is protected. And the Supreme Court has really gone to great lengths to make it clear that the fact that speech may be beyond the bounds of decency doesn't deprive it of protection. Unless it's very much focused on an individual or individuals as a threat. REHMHere's an interesting email from Lindsay. She says, I'm an American in Europe, and listening to this conversation with interest. There's currently the trial of the Dutch politician Geert Wilders for hate speech in the Netherlands. Marine Le Pen and the AFD in Germany are further examples. I would be interested to hear what your guests have to say about this kind of dangerous speech in Europe where the rise of populism has also increased inflammatory rhetoric. Susan Benesch. BENESCHGeert Wilders, for example, is a well-known Dutch political figure who, indeed, has been prosecuted, not once, but repeatedly, in the Netherlands. When he tried to go to the UK, he was prevented from travelling there. In other words, in Europe, in contrast to the United States, there are indeed many laws against hate speech and its varieties. I am not convinced, though, that criminal prosecution is successful either in silencing people who speak hatefully or in preventing people from listening to and being convinced by what they say. EPPSI tend to agree about the inefficacy of these laws, but we need to remember that Europe had a very different experience with free speech in the 20th century than the United States has. Where hate speech, systematic, organized hate speech stripping groups of their dignity and calling them horrible libels led to blood. It led to holocaust. And it's not surprising to me that these countries then, after the war, have put these standards in place. We have been spared that in this country. We consider ourselves an exception and we testing now whether we really are. REHMTo Brad in Cincinnati, Ohio. You're on the air. BRADHi. Thank you for taking my call. BRADSo, 50 minutes into your program, Diane, and your guests begrudgingly, finally admit that it was the other side that actually committed acts of violence against Trump supporters. I just want to make that observation. And then, you opened up your show by saying that, you know, Trump supporters would have no right to be upset if the election didn't turn out in Trump's favor, because the system is not rigged and there's no evidence of the system being rigged. However, Donna Brazile, a CNN contributor, was found to have fed questions to Hillary Clinton during a debate, or for a debate. BRADAnd the DNC Chairman, Debbie Wasserman Schultz was asked to step down because she was biased for Hillary Clinton against Bernie Sanders. Those are just two examples of how the system is rigged. REHMAll right. Doyle, do you want to respond? MCMANUSWell, that's a common set of facts that are circulated among Trump supporters as evidence that the system is rigged. Now, what Donna Brazile did -- she did not, in fact, feed questions to Hillary Clinton during a debate. She fed questions to the Hillary Clinton campaign before a town hall interview. It wasn't one of the debates with Mr. Trump. It wasn't even one of the debates with the other candidates. Was that unethical? Yes. Should she have been fired? Yes. MCMANUSWas that beyond the norms of American politics? Sadly, no. But the important thing is, is that evidence that our election, one week from now, is going to be rigged? Is going to be illegitimate? I don't think it stacks up as useful evidence on that question. REHMAnd you're listening to "The Diane Rehm Show." And to Melissa in Noblesville, Indiana. You're on the air. MELISSAThank you for taking my call. And thank you silences and your voice, Diane. And your panelists. I just want to say that while I'm fearful of Donald Trump's speech, I'm almost more fearful of somebody who civilly gaslights and is dismissive such as Governor Pence. Living in a state where we have a supermajority of Republican, white, male, Christian legislators, there's been an increase in sexual assaults. There's been an increase of a number of organizations being followed by the Southern Poverty Law Center. And I'm very afraid of the backlash. MELISSAWe already had a huge backlash at a local level after President Obama was elected. It's very frightening with the -- what could happen if, regardless of who was elected as President. It's, it's, it's terrifying in a way. I've never heard -- I live in a suburb. I've always lived in suburbs. I've never heard more people talk about guns and more people not even be able to be civil in discussion. Thank you. MERCIECAYeah, I love that you brought up gas lighting. For listeners who aren't familiar with that term, it's where someone, usually in an abusive relationship, tells you that what you think is true is not true. I saw a twitter yesterday that had been circulating, I guess, since June, and it said, someday, Donald Trump is going to look a reporter directly in the eyes and say, I never ran for President of the United States. (laugh) That's an example, I think, of gas lighting. MERCIECANot to diminish your concerns, but yeah, this is -- it's a fascinating time to be an analyst of political discourse. Because it really does circulate in these discourse communities that are incompatible. So, we've heard so many callers charging us, today, on the show with being one sided and not telling the whole story. And they themselves are cherry picking examples of things that have happened. And those things have happened, but those exemplars are held up in their discourse community as the proof. MERCIECAWhere in other discourse communities, those would be just, you know, more examples of other things. It's just fascinating to me. REHMAs our Constitutional lawyer on the panel, Garrett Epps, gonna give you the last word. EPPSWell, I think that we are in a situation where a lot of the things that the caller described are happening. We've got -- we're taking damage as a political system below the waterline. And our justice system is ill-equipped to, to deal with it. The First Amendment certainly protects -- prevents most sort of instant responses, which is to say you can't talk that way about groups and so forth. And probably, that's good. But, you know, we've seen a failure down the line. And I'm a former Oregonian. EPPSAnd we had armed protestors terrorizing the community for 41 days who went into court and said, we are simply citizens engaging in peaceful, civil disobedience with our semi-automatic weapons. And they were acquitted. So if our commitment to real discourse fades as a country, we're done. REHMAnd we'll have to leave it at that. I hope our loyalty to civil discourse remains. Thanks for listening all. I'm Diane Rehm.